Do you have a childhood hero? Ever wanted to pay homage to whomever he or she may be? That’s exactly what privateer AJ Catanzaro is doing. 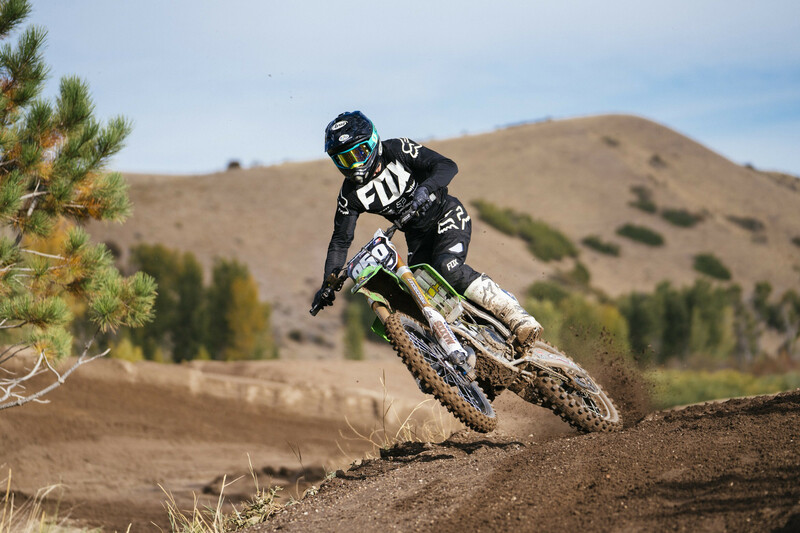 With this year’s Red Bull Straight Rhythm being a two-stroke only event, Catanzaro decided this would be a perfect scenario to pay tribute to the man known as James “Bubba” Stewart. If you follow AJ on Instagram, you may have seen the photos and video teasers of him on a Kawasaki 125 donning the number 259 on the number plates. Obviously we were intrigued, so we hit up “the Cat” to get the scoop on this project—as much as we could without spoiling the project. Keep an eye out on social media and at Red Bull Straight Rhythm to see the final product! Just watching YouTube vids of Stew on a 125! You ready for October 20? Ready to do my best and pay homage the best I can. I feel darn fast on a 125, so we’ll see! Let’s just dive right into this. The teasers, the photos—what the heck do you have going on with this #259 project? So basically I contacted the promoter of Red Bull Straight Rhythm and we had a quick brainstorming session on the phone. Seeing as how I race a Kawasaki, I immediately thought of doing a Stewart #259 tribute. He loved the idea, then the search for a bike began! I sent an Instagram message to Spencer Luczak, who built “Roxanne,” which is the nicest KX 125 I’ve ever seen. He responded right away with a ton of interest, and it escalated from there. We got a race budget in place thanks to RAK Racing, The Collective Experience, Federal Hill Home Theaters, and MotoTape, and began covering all our bases, from custom graphics to make my sponsors’ logos look like the original bik, to having custom gear made up that we’ll be wearing for RBSR. Hold on, Roxanne? 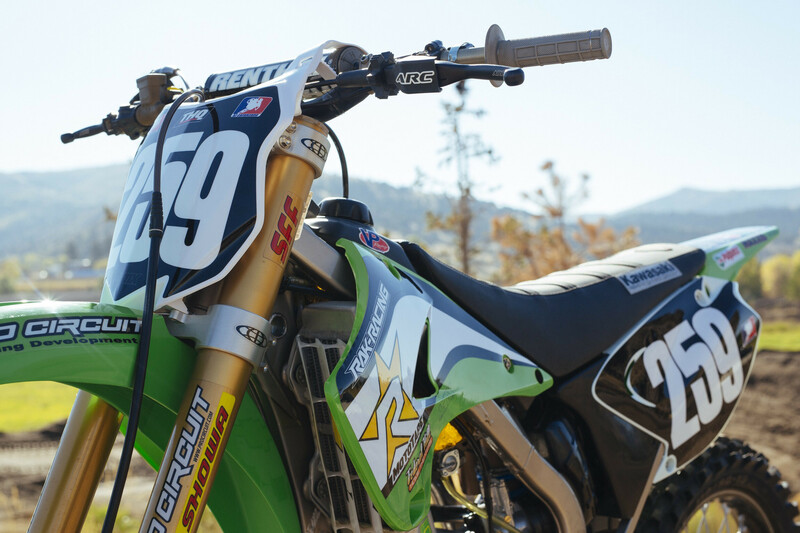 Your dirt bike has a name? [Laughs] Yes! Roxanne is Spencer Luczak’s baby, and no corners were cut in the making of this bike. It’s the closest thing to a factory bike I’ve ever ridden, so I’m excited, to say the least! What made you want to do this tribute? Growing up, I had a lot of heroes in the sport, but no one sticks out more than James Stewart. He did things that seemed alien throughout his career, especially in ‘02-04 on the 125. His riding style singlehandedly changed the sport more than anyone else in the history of SX/MX. I also think that the moto world is still hungry for more Stew! Who else can disappear from racing a couple years ago and still create this much hype?! The photos on Instagram and video clips have been great. I assume there’s a legit video dropping soon? Yes, we’ll be releasing a raw video as well as a more full-length video with behind-the-scenes stuff/interviews. We did the video shoot at The Flying Iron Horse Ranch in Utah, which will make for a very aesthetically pleasing end result. I was just about to ask about the track where you did this. It looks so prime. Can you tell us about that place at all, or is it private? It’s private at the moment. Unfortunately, the Luczak family is having a bunch of issues with the town. It’s a national-caliber facility surrounded with a river that flows right beside it. The track definitely made getting the shots easy. Let’s talk fan engagement. How has the reaction been on social media to this project? The reaction has been nuts so far! Naturally you will get the negative comments: “Those shoes are too big to fill”, etc. However, once people realize that this is simply a tribute to pay homage to my childhood hero, they don’t have an issue with it. It’s certainly a great way for a privateer like myself to keep my name relevant in the off-season! How cool does that bike feel when you’re riding it? The 125 feels like a toy. It definitely took me a couple hours to get used to a two-stroke again, but once I did, I was able to place that bike wherever I wanted and throw it around so easily. Luczak’s property is at over a mile of elevation and it’s sand, so I’m excited to ride the bike at sea level and on a hard-packed surface; it will be FAST! It’s just a very nostalgic feeling. Sitting on a two-stroke and smelling the fumes brings me back to the amateur national days. Do you feel like James when you throw that thing around? Riding the bike after recently watching videos of him from ‘02-04 race season only makes me wonder how half of what he did was even possible! I’ve been watching YouTube vids this whole time wondering the same thing. What are some of your favorite Stew moments? There’s too many to list. An old-school one that comes to mind was Budds Creek, where he crashed in the first turn and came back to win. More modern, I would say, Toronto 2014 comes to mind. Just something about the way he rode that track was completely next-level. I think he was doing three rhythm sections that no one else was doing. Just a legend. Getting back to Roxanne. What year is she, and can you tell me about any of her accessories? Spencer spent two years turning a 2004 KX 125 SR he bought for $1,000 into a masterpiece. Almost every piece on the bike has been rebuilt, replaced, or completely customized. CNC-machined front caliper (mag color) with Ti and billet aluminum pieces, custom-braided black steel brake lines with gold banjos, 280mm front rotor with matching rotor in back. Mag cerakoted master cylinders. 2018 Honda Master cylinder up front with 11mm plunger. She sounds dialed. I’m guessing there are more surprises to be unveiled at the event? As far as gear and stuff like that? You have to wear pink gear! Yes, we will have custom made gear for the event, which I’m excited about! It will really complete the look. We also have some very cool sponsors for the event that’s primarily made up of my inner circle. My title sponsor RAK Racing, which stands for Random Acts of Kindness Racing, will be on hand, and we will be doing a bunch of unique charity acts throughout the race weekend. The Collective Experience will be offering a complete VIP experience that’s offered from the comfort of the fans home, which is a brand-new way for fans to experience the race and get a behind-the-scenes look. We also have MotoTape and Federal Hill Home Theaters, which are two companies that have been 100 percent behind me the past couple of years. For a privateer like myself, adding another race to the schedule can be very difficult. With Spencer’s help and with the help of these awesome sponsors, we were able to build a top-notch program that I’m proud of! I’m really stoked on this project and can’t wait to see the final product. Anyone else you want to say thanks to? There’s a lot of companies who made this all possible! RAK Racing, The Collective Experience, Federal Hill Home Theaters, MotoTape, the Luczak family, The Flying Iron Horse Ranch, Acerbis, Scott Sports, SGB Suspension, Maxxis, Arai, EVS Sports, AGMX Graphics, Ridersville Cycle, Patched MX, Motostuff, Ride Engineering, Dubya, Lectron, Proven Moto, and Lululemon.